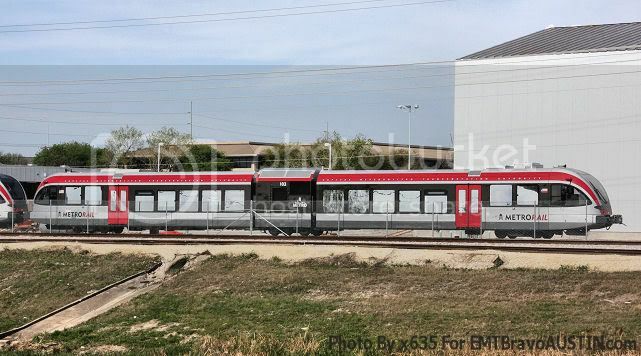 Here is a shot of one of the brand-new Capital Metro (Austin, TX) Metro Rail's new MU sets, built by Stadler Bussnang AG. I know they've been having some trouble getting the trains certified by the FRA due to their antiquated rules, but these trains will hopefully be launching this year! I hope this will be the start of a very succesful new commuter rail system! Very comprehensive website about the whole system, it's operations, etc. One of the neatest things about these trains I think is that they are going to have Wi-Fi. Also, it's cool that they are not some cheap light rail system, they full diesel powered MU's that will run on regular railroads along with freight trains. Also, it's cool that they are not some cheap light rail system, they full diesel powered MU's that will run on regular railroads along with freight trains. Not if they're not certified by the FRA for crash-worthiness, they're not. With non-compliant cars, you'd need a waiver (which the FRA will simply not give in this case), or some time separation arrangement, or some "extended temporal separation" arrangement as is used on NJT's RiverLINE. Capital MetroRail is preparing for service to begin on the Red Line on Monday, March 30, 2009. Sleek, new trains will take you to work in comfort and style, providing you with high-back seats, bicycle and overhead racks, and Wi-Fi connections. Some seating areas will feature tray tables. Capital MetroRail’s initial service will be during morning and afternoon peak hours. Regular and special shuttle buses will whisk you to your final destination. The Red Line will run on 32-miles of existing freight tracks between Leander and Downtown Austin. It will provide convenient service for suburban and central Austin residents. Future connections are being studied along existing Capital Metro freight tracks from Downtown to Manor and beyond. Future extensions along TxDOT’s abandoned MoKan corridor are also possible. Would this be classified as "diesel light rail" like the southern New Jersey RiverLINE and the Sprinter near San Diego (which can share tracks with freight trains only in time-separated mode because of FRA restrictions), or as "commuter rail" (in which the vehicles can run in mixed traffic with freight trains)? [added] Apparently there's controversy about this. Austin intended this line to fall linto the "diesel light rail" category, but as of last September, the FRA wanted it to meet "commuter rail" standards, even though freight trains will use those tracks only in strict time-separated mode. Although waivers have been issued by FRA for new LRT (or DMU-powered light railway) starts over the past several decades, the current staff apparently think that some of those waivers were ill-advised. I also read somewhere that there is a commuter rail line currently? under construction between san antonio and austin that is supposed to open in 2010 or 2011.. can anyone verify this? That is correct. UP has two parallel lines between the cities. IIRC, the plan is to move all freight traffic to one of the lines, and upgrade the other for passenger commuter rail. So, 2011 is a realistic number on this project? I'm asking b/c san antonio and Austin are two places I have consideref relocating to.. The system will launch on Monday, March 30th 2009 (about two weeks from now). There will be "Grand Opening" festivities on Saturday, March 28th 2009 at the Downtown Austin station (and other stations), and those participating will have a chance to ride the trains for free. During the first week, tickets will be free. It is expected that this system will be at capacity from the start. This system is operated by Veolia Tranpsortation system. The engineers are employed by them. I believe track maintainence and equipment maintainence is also handled by them. This is considered "heavy rail", but by riding the cars, you'd never know it. They are powered by twin 600HP Cummings Diesel engines that sit inbetween the two cars to each set. Each set (2 cars) can be coupled up to three (6 cars) , but right now since they have only six sets and some issues with train length and station platforms, you'll only see one set at a time. To note, the platforms at the all-new stations are designed to be expanded as the system grows. Each train can handle 208 people, 98 seated. All trains have free on-board Wi-Fi. Max speed set by the FRA is and will be 60MPH. Average speed will be 35MPH. Time from Leander (first stop) to downtown (terminal) is about 45 minutes and is the system is 32 miles long. For right now, they will run at half hour intervals during the morning and evening "rush hour" periods. There are numerous "Quiet Crossings" as well. A monthly pass which allows unlimited train and bus access is only $36. With everything, this 32 mile system came out to be about $3 million per mile. Very exciting time for rail in Austin, TX! Well, so much for the March 30th start date. When it opens - it will be worth the wait! Those trains are super nice! Free Wi-Fi (www.ridernet3.com) on the train!!! superbad wrote: So, 2011 is a realistic number on this project? I'm asking b/c san antonio and Austin are two places I have consideref relocating to.. I would say no. Texas has been dragging its feet big time on passenger rail, and it has the 4th largest city in the country. But: they're "thinking about" establishing a Rail Division in TxDot. Maybe that will help. Here's another goodie: the legislature approved a Rail Relocation Fund a while back to route trains away from cities. Problem is, they didn't fund it. do they have a new timeline for the opening of this line yet? all the re-testing has to be close to done by now, right? No opening date has been set yet. Obviously, they want all the safety issues with the FRA resolved first. ° Began final system validation process on Aug. 3. This step consists of a thorough review and testing of all signal houses, crossing functionality, circuit plans and other field equipment followed by re-testing with a train. ° Began relocation of train detection equipment for optimum performance. ° Completed final optimization of signal preemption technology at crossings adjacent to intersections. ° Completed adjustments to railroad crossing safety equipment pending any new issues. ° Completed design work to address gate timing issue at crossings near the Kramer, Crestview and Highland stations. ° Completed train engineers’ comprehensive contingency training and passenger simulation training. ° Completed track rehabilitation at 183 and Parmer crossings. ° FRA completed follow-up inspection July 27-31, and issued no violations. ° Complete full-service test runs to adjust and finalize rail service schedules to balance arrival and departure times, the number of trips, service cost and reliability. Some trips may begin or end at stations other than Downtown or Leander to optimize the level of service based on available track capacity. ° Complete final signal technology adjustments and enhancements, including relocation of train detection equipment. ° Complete final system validation. This process ensures consistent and reliable operationof all components working together. ° Complete signal communication system redundancy to remedy any remaining communication issues between field control points and the dispatch control center. Capital Metro will report back to the community in mid-September if not sooner. Latest CapMetro report for Metrorail released September 28, 2009. Capital Metro President & CEO Fred Gilliam to retire on October 16. They really need to make it easier to open modern diesel rail lines in this country.